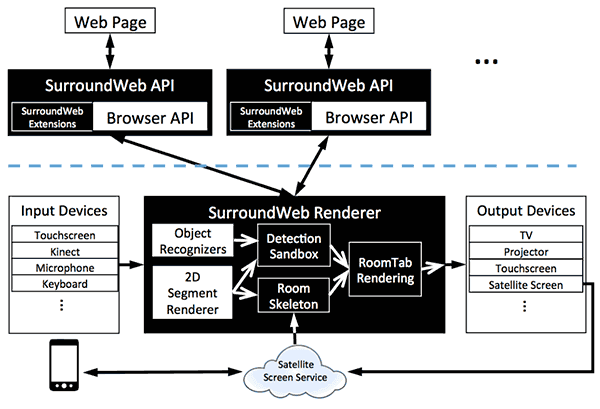 Microsoft has published a concept paper on its research web site in which it describes a concept it calls SurroundWeb a means for displaying web content on multiple flat surfaces and satellite screens in a physical room. The concept relies on Kinect technology to scan a room to "recognize" flat surfaces and other objects. Once that's accomplished it would use software to parse out different parts of web content which it would divvy out to different surfaces (or satellite devices such as phones or tablets) in the room, effectively adding more screens. The idea is that different parts of web content would fit just right onto different patches of walls and other flat surfaces. 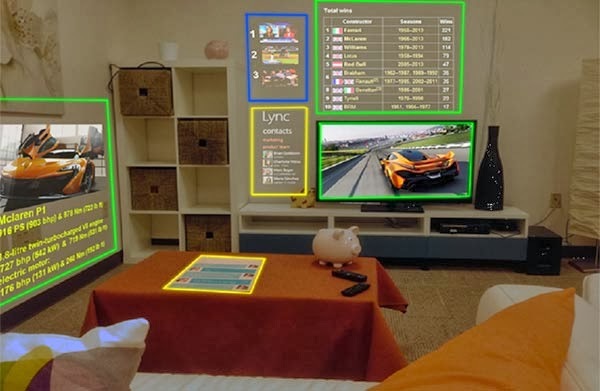 At first blush, the concept appears rather simple a closer look, however, reveals that what Microsoft is actually proposing is a way to create immersive applications for the home that don't violate the privacy of their users. As its name implies, SurroundWeb is Internet based, thus, if such a system were to scan a room and allow information about what is found to make its way to the web, all manner of privacy violations could occur. In its concept paper Microsoft outlines how SurroundWeb could be implemented without violating privacy. The design of the system would mimic operating system design different parts would be allowed access to different information each level having access only to what it needs to function. As an example, if an initial scan of a room reveals a can of a certain brand of soda sitting on a table, that brand information data would become a trusted object, available only to a section of the "local" software that allows for an ad to be displayed showcasing that or a related type of product. In such a scenario, the brand identity would never be able to make its way to the web, yet ads could still be displayed based on user preferences. Such recognition could also serve in the user's favor as is noted in the paper if a pot in the kitchen begins to boil, for example, a message could be displayed in another room as an alert. In its favor, the SurroundWeb concept is being put forth in a public forum, which means readers of all technical levels can study the idea and trade opinions regarding the soundness of the design. Thus, if there are privacy holes in the system, others will find them allowing Microsoft to refine the idea until the concept is deemed "safe." SurroundWeb is still just an idea, one that Microsoft is clearly tossing around. Only time will tell if the company decides it's an idea worth pursuing.